Nearly five years ago, the Canon 5D Mark II changed cameras forever by turning video into a DSLR feature. It became the darling of indie filmmakers, war photographers and anyone in between who had a need for incredibly convenient, visually distinctive moving pictures. It still is. But it's about to get one-upped. Holler at the Canon 5D Mark III. While the Mark II broke new ground, it's outdated. The Mark III promises refinement and sharper tools: better photos and video that's easier than ever. This is not a coup-de-camera so much as a revolution more fully realized—a more perfect $3500 DSLR. What you get is a revamped full-frame image sensor, and Canon's new Digic 5+ image processor. 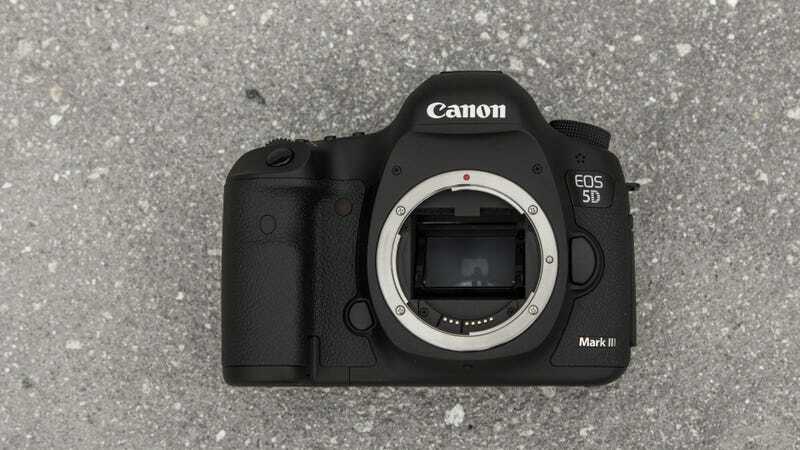 The Mark III promises to be faster, more powerful, and more versatile than the beloved 5D Mark II. Canon says it will deliver better photos in the dark, more video options, and precision control over your shots. Will this be the new photographer's workhorse? Let's start where the image-making magic happens: the sensor. The 5D Mark III's 22.3-megapixel, full-frame sensor is brand new. Discerning readers will notice that the slight bump up from the Mark II's 21.1 megapixels means more pixels in the same size sensor. Which means that the pixels are now slightly smaller. You might think that this could hurt image quality in poor lighting conditions, but Canon claims that just the opposite is true, that the pixels actually get more light now because of the way the new sensor is designed. Its gapless micro lens design supposedly lets more light in—we haven't tested this yet, but its the same tech as used in the 1 DX, and that thing is a low-light monster. The electronics of the sensor are also more efficient than before, which helps reduce noise. The result is that the Mark III can now shoot full-resolution shots at a whopping ISO 26,500—two stops past the Mark II's ISO 6400 limit. What does that mean for you, the photographer? That the 5D Mark III will shoot comfortably when the the 5D Mark II has been pushed to its low-light limit. Then, if you hit the ceiling with the Mark III, the images won't be as noisy or distorted as before. Beyond the sensor, it's useful to think of the 5D Mark III as the little brother to the new, super-badass Canon 1 DX. With ISO topping 204,000 and a price tag approaching $7000, the 1 DX is an unstoppable, unaffordable mammoth of a DSLR. Fortunately, though, some of its nicest features have been handed down to the Mark III, starting with the Digic 5+ processor. The 1 DX has two of them, and while the 5D Mark III only has one, that one processor is 17 times faster than the Digic 4 powering the 5D Mark II. What's that mean in practice? The 5D Mark III's autofocus will find its mark faster, will fire more quickly when you press the shutter release, and will be able to process the data in a flash so you can get back to shooting. In fact, Canon has sliced shutter lag down to just 59 milliseconds, which makes the 5D Mark III one of the fastest responders out there. What's more, this generation will peel off stills at up to 6 fps instead of just 4 fps. In some cases, that's the difference between getting your shot and missing it by a hair. The 5D Mark III doesn't borrow just from the 1 DX's brawny DNA; it's inherited the smarts of other members of the Canon clan as well. In particular, you'll see welcome glimpses of the Canon 7D in how the camera measures light and picks a focal point. The new 61-point autofocus on both cameras is a meticulous photographer's dream, and a definite improvement over the Mark II's humble squadron of nine little viewfinder dots. In the Mark III, that squadron is now a phalanx of 61, which can be configured into a number of battle formations to make sure your photo is sharp. The 5D Mark III's metering system has also been reinforced; It now reads 63 zones to calculate how much light is hitting your sensor instead of the previous 35. Not every general needs that many soldiers, but not many would refuse the extra manpower. It's important to remember that the Canon 5D Mark II owes much of its popularity to its 1080 video chops. And it's equally important to note that, as Canon's first HD DSLR, it still had plenty of room for improvement. First of all, unlike the 7D and other more recent Canon DSLRs, the 5D Mark II can't shoot at 60 fps. Why does that matter? Shooting at 60 fps gives you the flexibility to create slow motion footage, by reducing the video to more commonly used frame rates (25, 30). It's a useful effect, and one you can now take advantage of with the 5D Mark III. It shoots 60 fps, albeit at a reduced—but still HD—720p resolution. Secondly, while the 5D Mark II had a handy input jack so that you could use an external mic to record higher quality audio, it didn't have a headphone jack so you could actually monitor your audio levels. Not listening to what you record is the easiest way to ensure that it doesn't turn out how you intended, no matter how fancy your mic is. The 5D Mark III fixes this problem with a stereo headphone jack. Aside from these hardware and performance improvements, the 5D Mark III is packed with tiny tweaks that will appeal to photographers of different persuasions. For a couple hundred bucks apiece, you can pick up a GPS or wireless transmitter for easy image transfer. Thanks to the burlier processor, the camera now also has new multiple exposure and HDR modes, each of which combines many photos into one, to different ends. The former will cobble together a usable picture from poor shooting conditions, while the latter is used to create artsy effects in your photos. You know, just in case you want them to look embossed or something. The design of the camera is similar to the 5D Mark II, but the pre-production version looked slightly larger than the 5D Mark II and it's got a few new buttons, the most important of which are carried over from the 7D. There's a multi-function button next to the shutter, which can be programmed to control four key shooting settings. There's also a new start/stop recording button for video, and a "Rate" button so you can tag good images on the fly. Canon has packed the thing with CF and SDHC card slots for lots of storage. The list goes on, but you get the point: this looks like a rad camera. From what we've seen, the Canon 5D Mark III is going to be incredible. Of course we won't know until we actually try it; there's no guarantee that all these tweaks and improvements will work as advertised. There's a lot of brand new technology that's never been used in the wild, squeezed into a tiny body. Will the new processor be as robust as it sounds? Will that new sensor turn out to be glitchy? Will the new autofocus disappoint? It's not likely, but it's not impossible either. Part of what makes the 5D Mark II so great is its simplicity: It takes great pictures and it shoots beautiful video. The only sure thing is that the 5D Mark III loads on the complications.